Searching for interesting crime fiction in bookshop shelves in the English-speaking world the reader is now offered a wide variety of titles in translation from all over the world. Although for many years American and British authors have been perceived as producing the greatest variety of novels in the genre, one particular country has quietly been doing its own thing – France. Crime fiction aficionados are lucky that some of the best contemporary French authors are now being published in English. For anyone who is not familiar with this interesting branch of the genre, what follows is a brief history that will clarify what makes it special and why it holds such a significant place in French culture. Its cultural value can be judged by the fact that the genre is not only taught in primary schools using guided anthologies with short extracts from a wide variety of French and other authors (Littérathèmes: le policier. Anthologie pour le cycle 3, (Paris: Éditions Retz, 2003. 272562245X). But also from November 2003 to the end of February 2004 there was an exhibition targeted specifically at young readers at the specialist crime fiction library in Paris (Bilipo ) which was additionally celebrating the 30th anniversary of its opening. The accompanying book, co-produced by the Parisian library services and La Joie par les livres a Ministry of Culture and Communication organisation, contains interesting articles and suggestions for further reading for both children and adults. (Enquête sur le roman policer pour la jeunesse, sous la direction de Françoise Ballanger, Paris : Paris Bibliothèqes/La joie par les livres, 2004. 2951375324). Although the development of the genre in France has had a chequered career, with many ups and downs, its origins can be traced back to the memoirs of Vidocq, a criminal, published in the early nineteenth century. 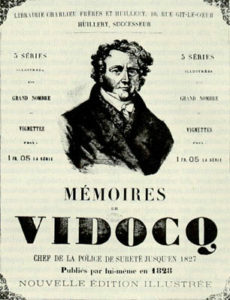 Vidocq became Chief of Police in Paris, and his memoirs not only inspired novelists like Balzac whose character Vautrin was inspired by Vidocq, but also were influential for Edgar Allan Poe when he wrote The Murders in the Rue Morgue. Poe was popularised in France in a translation by Baudelaire, and this in turn inspired other writers to create narratives dealing with crime, its solution and the punishment of criminals. Ian Revie suggests that although the French label for these narratives is “roman policier” often contracted to “polar” implying a viewpoint of the forces of order, it is criminal activity that has always been of more interest to French readers. In particular it is the ‘authentic evocation of the criminal milieu’ and the slang that these characters use that have given readers that frisson of excitement as they lift the veil to the dark underworld normally hidden from society. Historically it was Émile Gaboriau who in 1864 first introduced the public to Monsieur Lecoq (in the novel Monsieur Lecoq). This young policeman likes to look deeper than his superiors into crime in order to uncover the truth and achieve a fair conviction rather than a quick one. Originally a writer of episodic crime fiction for the newspapers, in this novel Gaboriau ambitiously created a broader, more serious investigation into the intrigues and characters of that period in a similar way to the novels of Balzac. Writing at the same time as the Goncourt brothers it is clear that he shares some of their naturalistic literary pretensions. In Lecoq he offered the reader both the archetypal hero fighting for truth and justice and the first French police detective. His police superiors were portrayed as incompetent and only looking for easy solutions. It was not until the early twentieth century that we find the next major French contributors to the genre. In 1907 both Gaston Leroux and Maurice Leblanc offered readers two different principal characters. Leroux created Rouletabille, a young reporter who challenged the police with his dogged unravelling of a puzzle, though he seemed to prefer to match the solution to his own ideas rather than following up clues which did not match. Two linked novels were produced – Le mystère de la chambre jaune and Le parfum de la dame en noir. In these the mystery to be unraveled is not only an attempted murder but the puzzle as to the identity of Rouletabille himself. Leblanc, on the other hand, created a lovable Robin Hood character in Arsène Lupin, a gentleman thief who always gets the better of the police and the forces of law and order. Stealing from the rich and righting what he perceives as imbalances and meting out his own justice were his main aims while at the same time making fun of the police. Both these characters appealed to French readers who seem to have a greater tendency to treat the state and the agents of the state with contempt and are indelibly linked to the way the French see themselves in relation to these forces. It is only in the thirties that we see the emergence of the first policeman detective but who has a particular interest in human nature, Inspector Maigret. Georges Simenon, a Belgian and thus possibly an outsider to metropolitan France, created Maigret as the intuitive leader of a team of policemen. He also has a home life, though Madame Maigret is never given a Christian name and realism a shadowy figure, and he certainly suffers many self-doubts. The psychology of the criminals and understanding what has driven them to commit crimes is what interests Maigret more than simply solving cases. With Simenon the atmosphere of the geographical surroundings as well as the weather as an influence on mood and action are significant. Reading his descriptions now, they often seem like filmic scene setting descriptions; his capacity to do this may account for the number of his novels that were adapted for the cinema. Certainly modern writers like Didier Daeninckx and Fred Vargas use place and natural phenomena in a similar way, effectively as characters in themselves. Literary authors like Alain Robbe-Grillet (The Erasers, 0802150861) not only experimented with the new novel but also with crime fiction. Other genre writers, like Sebastien Japrisot, created crime novels that reflected literary experimentation (Trap for Cinderella, 1860465528.) However, since this time most critics have chosen to consider anything with a crime fiction label as not having literary value. Since the sixties the death of the genre in France has regularly been predicted, even by people like Pierre Boileau and Thomas Narcejac who produced many acclaimed jointly-authored novels as Bioleau-Narcejac. They created narratives which mainly foregrounded the victim and kept the reader in breathless suspense as to when the crime would take place. They particularly benefited from cinematic adaptations of their texts by Hitchcock and others (Vertigo).Their suspense narratives were a particular hybrid form of French crime fiction positioned between the traditional whodunit and the thriller. Certainly the psychological thriller has proved popular in France, where Patricia Highsmith finds that she receives more acclaim than in her native country. Although Todorov’s structural analysis of crime fiction in Poetics of Prose (1977) discussed the typology of the genre and its historical variations, his conclusion was ambivalent regarding writers in the genre who were not obeying generic codes and rules. This is particularly important in France where literary fiction is clearly defined by the colour of its cover (cream) and anything different is considered as less significant, and labels for genres and subgenres abound but are not particularly helpful. In addition books are marketed and displayed in bookshops by imprint, so to find a particular author who might appear in more than one imprint you have to both know the imprint and search a number of different shelves. The best crime writing in France, particularly since the early eighties, has precisely inhabited this marginal space between literature and pulp fiction in order to permit experimentation and move the genre forward. Although aware of generic conventions writers choose to obey or transgress them or even play with them so that actively engaged readers are both challenged and entertained. Daniel Pennac is one author who took these to the limit with his Malaussène family saga which gently parodied the genre but effectively defies generic labeling. In these narratives solving a crime is a narrative thread around which a web of comedy, tragedy, love, hate, birth and death are sketched. The fantastic and wildly improbable action is played out against a fairy tale background of a Paris as a village community peopled by friends and family. There are six books in the saga and as well as dealing with crimes to be solved, Pennac makes serious points about French society today. Women writers have only been recognised in the genre more recently, although they have been contributing to it for some time as a much-cited thesis by Deborah Hamilton suggests. Certainly public recognition in terms of newspaper articles, critical and academic attention has helped these women writers to become more popular during the nineties and noughties. However, perhaps as a response to this lack of attention, many of these writers have specifically taken a feminist viewpoint featuring female main characters. The consequence of this is that they have often found it necessary to set their narratives in America rather than in France, thereby skirting the issue of the implausibility of French women in high ranking positions in the police. In addition, given the lack of private detectives in France, it is therefore less feasible to feature independent French women private eyes. As the setting and the reflection of modern France are important in French crime fiction, it is somehow diluted if we are not reading about specifically French problems and crimes, real or imagined. In addition to what has been noted above, as Stephen Knight alludes to the significant difference in the French justice system when he says that it derives from ‘the different, non-evidential, emphases of the French detecting system.’ (Crime Fiction 1800 – 2000: Detection, Death, Diversity 0333791797, p.160). Although this is an enormous subject, it appears in part to come down to the fact that a crime is investigated by the police in order to provide evidence to a criminal case judge who then has to decide whether there is a case to answer. This means therefore that fewer cases come to court than might be expected to and changes have recently been considered that should mean that this will happen less. So, whereas in the UK we accept that a judgment can only be made of guilt if there is evidence to convict ‘beyond reasonable doubt’ it seems that in France it has to do with the balance of probability which is a very different matter. It seems that French crime fiction reflects the general dissatisfaction of the French public with the actions of the forces of law and order, and a judiciary that may have allowed some criminals to go unpunished in the past. I have noted that changes are planned but I am not sure when they will be take place. Although some of the authors mentioned above have been translated in the past, a good number of them are now out of print but may be available second hand. However, at the present time one British publisher Harvill Press is trying to bring contemporary European writers to the notice of the English-speaking public. Two novels by a French writer, Fred Vargas, have recently been published (Have Mercy On Us All and Seeking Whom He May Devour). In France, readers can’t wait for her next novel to be published though they often have to wait as writing is her pastime rather than her main profession (she is medieval archaeologist). Her reputation as a stylish, inventive writer has developed exponentially with enthusiasts pressing friends to enjoy the latest exploits of her intuitive but exasperating Commissaire Adamsberg and his sidekick Danglard. Although her books are initially offered in C format paperback, libraries have been enthusiastic to buy them, and they will start to be available in the smaller format from summer 2005. The next title The Three Evangelists which features three unlikely researchers turned detective will be published in spring 2006.